(This recipe has been featured in the August, 2011 issue of A Healthy You). Thinly peel the fresh ginger, grate and mix with water in a large saucepan. Strain the liquid through a fine mesh sieve. Add the lime juice and honey, maple syrup, or agave. Stir until dissolved. Serve chilled. Add the lime juice and honey, stevia, maple syrup, or agave. Stir until dissolved. Serve chilled. If you don’t want to make a whole pound of ginger root, you don’t have to! 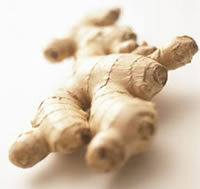 Use a smaller piece of ginger (3-4 inches in length) in a small pot of water. The mixture will be concentrated, so you will need to add water before serving (to taste). It is cooling and refreshing (with a snap).